Integrative medicine utilizes modern diagnostics and treatment modalities combined with a natural approach which allows the most effective, broad ranged treatments available. Integrative is a healing orientated medicine that takes into account not just treating the symptoms, but focusing on whole-body health, which is imperative to get the best and longest results. 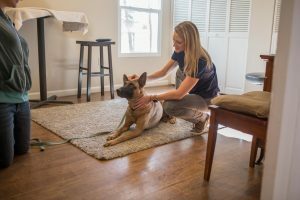 Mountain View Animal Hospital and Holistic Pet Care is a progressive practice that offers general medical services that parallel your typical general practice including wellness visits, soft tissue and orthopedic surgeries, and dentals however in addition, offer a integrative approach to these visits. You will be educated on how your pet may benefit from herbals, acupuncture, chiropractic / spinal motioning, and other natural approaches based on your pets age, breed, and health status.